I won't get into the big debate over how the word colour er..color should actually be spelled; and really, does it matter as long as it's big and vibrant like the hues found in these papers by Susan K. Weckesser? I love the thickness of these papers. They held beautifully with Helmar's Acid Free Glue, and took some Distress Stain with no issue. The felt splats are held in place with Helmar Premium Craft Glue. It's the best for felt, as it won't ever seep through, and holds on tight. I always like to add a little dimension to my pages. I fussy cut the darling little house, and raised it up using Zapdots. These papers can be found along with loads of great albums and products from Want 2 Scrap, and they ship worldwide! So in the end, it won't matter where you're from, and how you choose to spell Colour/Color! 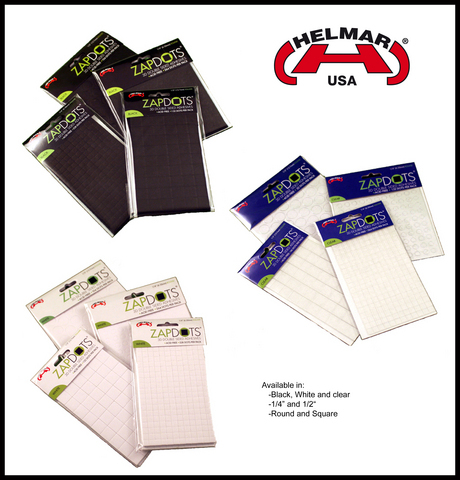 All the fabulous Helmar glues used can be purchased in North America here, or Overseas, here. You can always ask your local craft or hobby store to keep some in stock if they don't already. Hey Helmar fans. Cindy here wrapping up a week of Helmar Acid Free Glue. September is over and in comes the fall months with all the fall colors and holidays. I’m sharing an Autumn tag and a Halloween card, suing Helmar Acid Free Glue among other Helmar products in their construction. 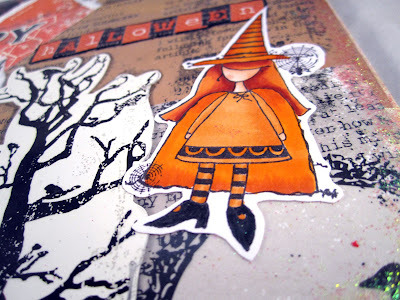 I love to make Halloween cards using free vintage Halloween images I find on the internet. I printed my image and adhered it to a mat using Helmar Acid Free Glue. I used my electronic die cutting machine to cut a witch image and 3 layers of a city scape, adhering all of them to the card front with the Acid Free Glue. No worries of image layers coming apart or falling off of the front of my card. I adhered the paper dots to my card using Helmar Silicone Adhesive because there is a void on the back of the dots that the Silicone Adhesive would fill nicely and adhere them to the card securely. My next project is a gift tag leaning toward Autumn colors with quilled mums. I use the acid free glue to adhere my paper layers together and also in the construction of my quilled flowers. Running a thin bead of glue along the edge of my quilling strip (die cut) just before I roll it into a flower assures me that the flower will not come undone. Finishing touches of gluing leaves to the tag and I have a tag ready to go along with an Autumn gift of maybe something fresh baked. Helmar Acid Free Glue is one of my favorite Helmar products. I use it for assembling all of my images cut on my electronic die cutter as well as layering papers. Can’t find Helmar products in your local stores? Helmar as two shopping sites available to you. One in Australia and one in the US. Ribbon Carousel and Helmar Hop!!! Ribbon Carousel has some wonderfulribbon organizers and that is how this amazing company started. Today, we get to feature some other wonderful products that they carry, so hop along with us and have fun. Hop along with us today and leave some blog love for our The Designers of Helmar and Ribbon Carousel for your chance to win!! It's Amy here today, with my first post as a Helmar Education Team member! I'm excited to share a project that's a little different than the typical "Halloween" or "fall" idea, and is a cultural celebration as well. This Day of the Dead frame and poem page, is a quick project that is also lots of fun. This is planned for a class of teens, for something new, as well as a cultural learning experience, learning about "Dia de los Muertos." I started with this bare, thrifted frame. I grabbed my Helmar Decoupage Paste (which is amazing...way better than any other product of its type I've ever used, it even smells yummy), and the thrifted frame, an old paint brush, and a dress pattern (also only a quarter at my local thrift store). I added decoupage paste generously (but not too generously) to the frame, and then laid pieces of the dress pattern (or tissue paper would work, as well), across the wood. I covered the entire frame, front and back. 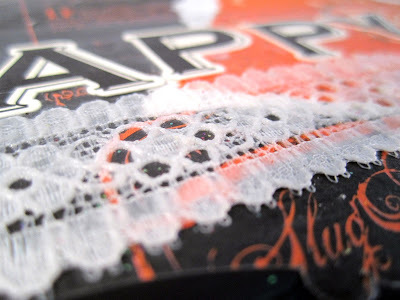 Add a second layer of the decoupage paste to the top of the tissue/pattern. The result (seen above) is a gauzy, aged look. After the paste dried, I chose to add a layer of Tattered Angels Glimmer Mist, in Graphite (dark grey), as well as inking the edges with distress inks. When the frame itself is complete, it is time to grab some embellishments, and my trusty Helmar 450 Quick Dry (or hot glue in a bottle). I know if I use 450 with these embellishments, they will stay put. I can't say that about the adhesives I used before I became a Helmar addict user. I chose the typical day of the dead colors of black and white, as well as a punch of blue and red. Roses would also be quite nice, and very appropriate and fitting. I chose a skeleton from a garland I had found at MIchaels, at a very good price. Inside the frame, is a Day of the Dead poem, added decoratively using my vintage typewriter for the text, as well as Graphic 45 papers, different types of washi tapes, some Prima flowers, and various trims and embellishments.The glitter is adhered with Helmar gemstone glue, and the papers with Helmar Acid Free....so this is a carnival of Helmar goodness! I think the teens will enjoy this project. It could easily be adapted for different holidays, or adding pictures of costumed adventures with their friends. The possibilites are endless with Helmar and creative minds! Thanks so much for joining me today here on the Helmar blog! Please drop by my blog, and say hello...I would be so excited to have you visit! To find the amazing Helmar products listed above, visit www.helmarusa.com (in the USA), and www.helmar.com.au (in Australia). Well it is Beck here again with another share of Helmar Goodness! I have just had a fun pay with some Helmar Professional Acid Free glue, and so I am now here showing you what I got up to! I received some divine stamps as part of the Unity/Susan Weckesser cross promo, and I just HAD to have a play with this cute little house and Family set. I just loved playing with it and here is the card I put together using it. I guess I had EVEN more fun when I challenged myself to come up with this double layout. I pretty much used Helmar Professional Acid Free glue to put the whole layout together. And how did I get the dimension in it with JUST Helmar Professional Acid Free glue you ask? I first take the papers that I want to add the dimension to and my trusty Helmar Professional Acid Free glue. I then add some of the Helmar Professional Acid Free glue to the cardboard. I then layer the cardboard piece with the Helmar Professional Acid Free glue between the papers I wanted to add the dimension in between. I hope you enjoyed my share today, and you get yourself over to the website to get some of your own to play with! Click Here (Australia) or Here (United States) to head on over. So many ways to use acid free glue! Hi Helmar Fans, Vicky blogging today to show you various ways I've been using the acid-free glue. First up, I created these pretty little kirigami boxes and cards using the new Spring Paisley collection from Meg's Garden and from some help using Helmar's Acid Free glue. There are so many uses for this glue but I decided to use it here in a less traditional way. It really worked great to hold my boxes and embellies together! 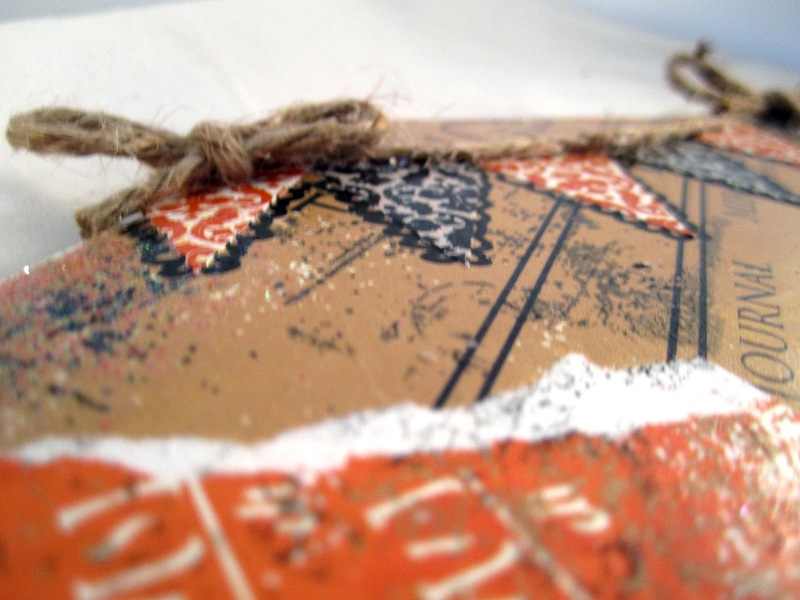 Here is a close-up of of one of the gift set that I played up the peach and cream in the paper. Here is a close-up of where I brought out the darker red and pink in the paper. Loads of Helmar Acid-Free holding this project together! The great thing about kirigami boxes is that they are just as pretty on the inside. Since they are folded, it means they are sturdy too due to several paper layers. My tutorial on how to create these boxes can be found archived on my blog HERE. 1. To cluster flowers around images. 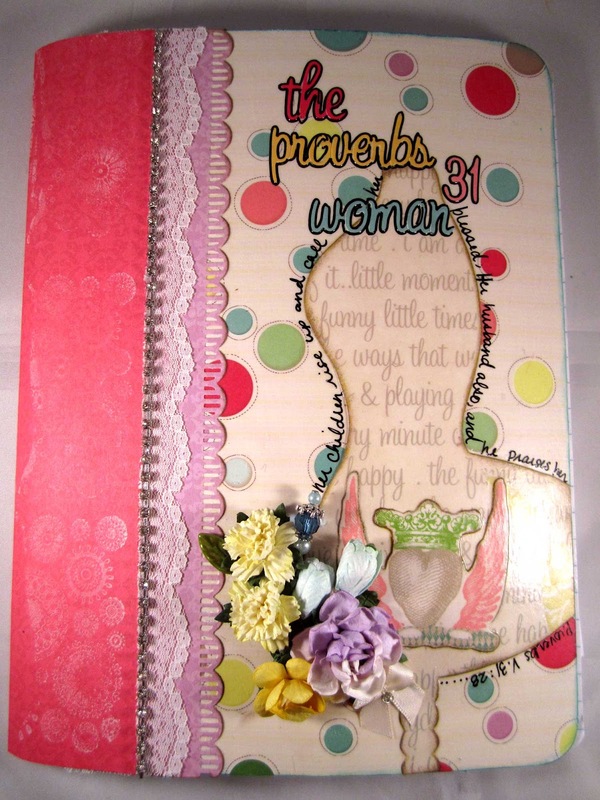 Please note this project was created using Pion Design papers and vintage images for breast cancer awareness as a cross promotion between Helmar and http://blog.craft-e-corner.com. Many awesome PINK projects created by the Helmar Design Team will appear on this site. Pink just happens to be my favorite color to scrap with too. All of the flowers are from Green Tara. 2. To adhere large and small pieces of chipboard (frame) onto a layout about my two boys (when they were toddlers). 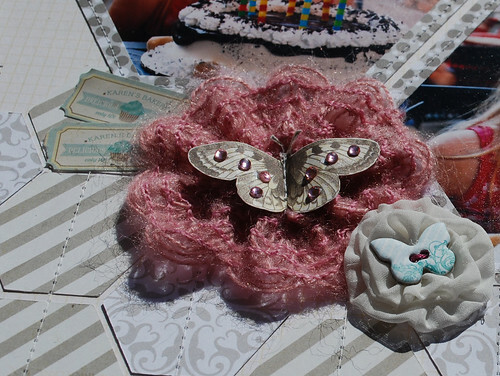 This layout was created with the September Swirlydoos kit and chipbord from my stash. 3. To layer images onto paper and chipboard on this layout of my daughter and I (she fell asleep on me duting a photo shoot when she was 9 months old). 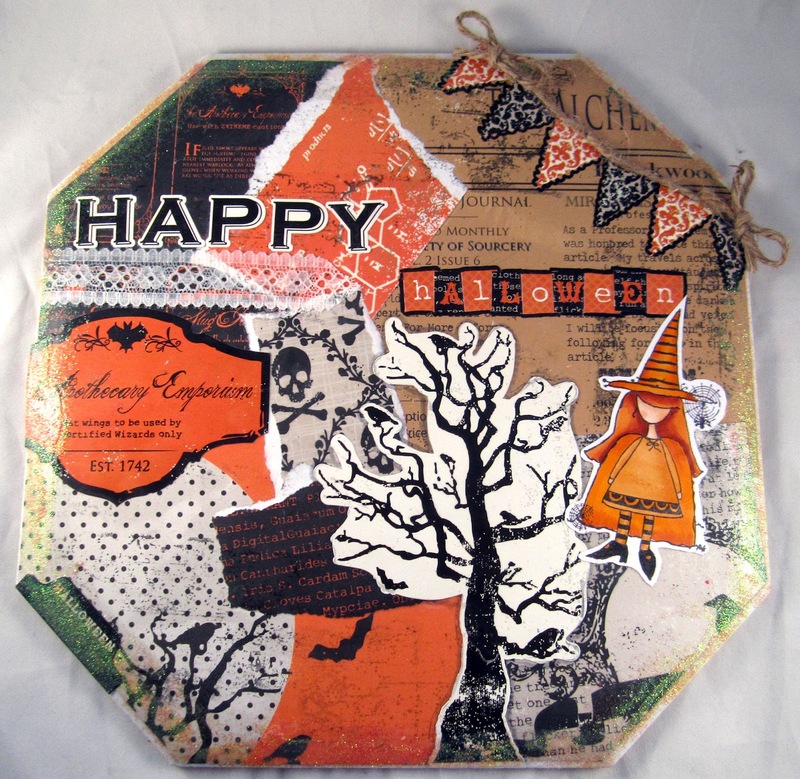 This layout was created using 2Crafty chipboard as well as the September Swirlydoos kit. For this page, I adhered all the paper and photos with Professional Acid-Free glue. Helmar 450 Quick Dry was perfect for that 'tricky-to-glue' ribbon. To glue this delicate quatrefoil die-cut, I held the die-cut vertical, then just rubbed it over the tip of the Acid-Free Glue bottle. Adding the adhesive like this gives just enough glue to hold, without oozing between the sections of the die-cut. A few tiny dabs with the Acid-Free were all that the twine needed as well. The flowers were adhered with 450 Quick Dry, and the 'flair' was popped with Zap Dots. It is no secret that I love using glitter! Although I don't use it for everything, I am a bitter of a magpie, so if it sparkles, I'm drawn to it. Now when you want great quality glitter and the biggest selection of textures and colors out there, Art Institute Glitter is the cream of the crop!!! Hello everyone, Erika Taylor here today to share with you a great Halloween Invitation I created using some wonderful colors from Art Glitter and my trusty Helmar Gemstone Glue. This glue is perfect for glitter and you can paint with it, to create amazing designs. You can purchase it directly from the Helmar Website and it is only $4.55 a bottle and will last you a very long time!!! For this invitation, I used Pumpkin and Cool Brown glitter. I love these two colors together. So full of Autumn!!! I used a combination of Helmar 450 Quick Dry Adhesive, 1/4" Black Square Zapdots and Helmar Quick Fix Adhesive Runner to create the project. (All available now, from our Helmar Store). Spooky but very cool i think. I think the glitter is absolutely beautiful and I love how sparkly it is! Would it be wrong to want every color and texture that Art Institute carries? I see a Scrappy Addiction coming on!!! 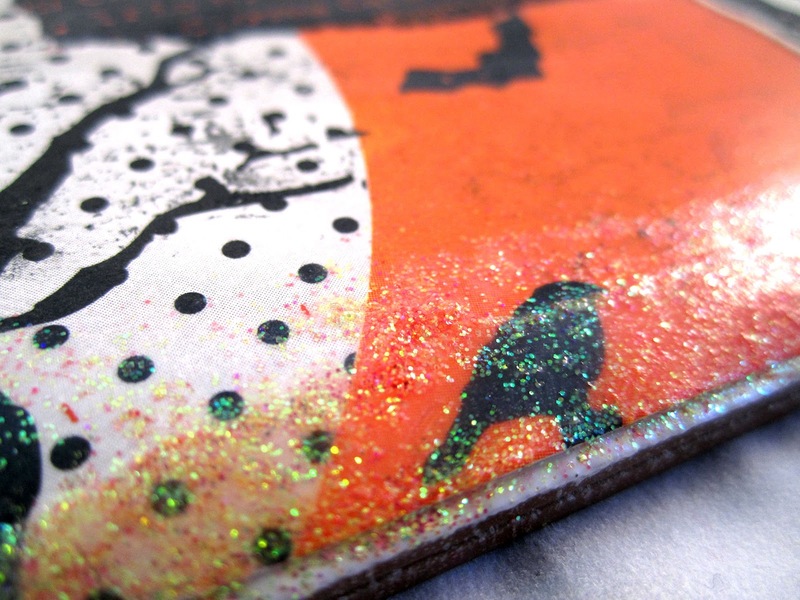 Check out the variety of glitters that Art Institute Glitter Carries. They have a great kit selection as well. Thanks so much for stopping by the Helmar blog today. I hope you have all enjoyed this Ghoulish Halloween Invitation. Make sure you pop over to the Art Institute Blog to see what they have been creating using Helmar Adhesives. You are going to LOVE IT!!! Hi everyone! It's Kate Vickers here today sharing a card made with Art Institute Glitter, Helmar Glue (of course) and My Mind's Eye The Sweetest Thing. In order to glitz up my card sentiment, I applied Helmar's Gemstone Glue onto the My Mind's eye dimentional die cut sticker with a paintbrush. It originally had a smaller sentiment on it, but I removed it and added another one later. I let the glue get to the tacky stage and then I added a lot of Ultrafine Transparent Glitter in Angel Dust overtop. I dusted off the excess with a clean paintbrush. I did this on top of a piece of clean paper so that I could return the unused glitter to it's container when I was done. Because the glitter is transparent, you can still see the patterned paper through it and it really adds a nice touch. It makes the card special. Without further ado, here's the card. I hope you like it! In this closeup shot, you can see the detail of the glitter quite well. I love how it catches the sunlight. I would also like to share this layout that I did with the Escape Kit (September) from Scrapbooking From The Inside Out. The kit features My Mind's Eye, Webster's Pages and Pink Paislee. I used quite a few Helmar products on this layout. I used 450 Quick Dry to create the flower out of the Maya Road trim and to adhere the butterfly to the center of the flower. I always use 450 Quick Dry when I need extra hold. I also used Premium Craft Glue to adhere my die cut hexagons and the photos to the page. I used Gemstone glue to adhere the gems to my butterfly. The gems were self-adhesive, but I always find self adhesive gems eventually fall off unless you give them a little help. Thanks so much for joining me here today! I can't wait to hear what you think of my projects. I am so excited about my first post as part of the Helmar Education Team and I want to remind you that there is still one week left if you'd like to join us. Just check out the Meet the Team & DT Call post. I did my first LIVE Ustream class last night and I want to share with you how awesome Helmar Decoupage & Craft Paste is in creating altered projects. This cute stamp I colored with Copic makers after I stamped her with Memento ink and I love that Helmar Decoupage & Craft Paste doesn't react with it. I made a thin line of the Helmar Decoupage & Craft Paste around the tile and sprinkled some of our preferred partner's glitter from the Art Institute. I also sealed the glitter with another layer so it won't flake off. Here is a smaller tile using the same process. 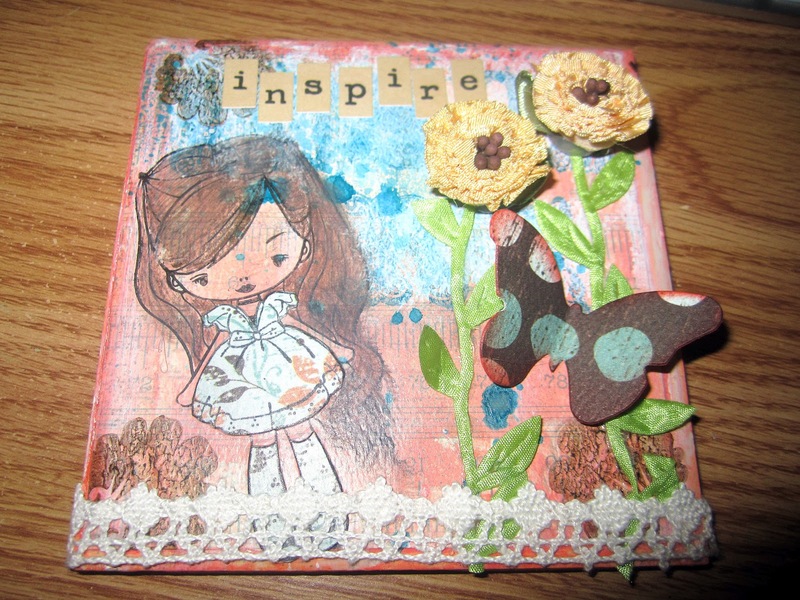 On this altered notebook, I used Helmar Decoupage & Craft Paste to seal my paper to protect it as I use the notebook. Thank you for stopping by today - here is the recorded video from last night's class!